The future of the planned new nuclear power plant at Hinkley Point remains in doubt as key French unions still oppose the project, BBC Newsnight has learned. EDF, which would build the plant, had delayed a decision on the project in Somerset until the summer while it consulted French union representatives. The company, which is 85% French state-owned, had hoped to win support from a committee of workplace representatives. But the committee said staff had not been reassured about the plant's costs. Trade union representatives hold six of the 18 seats on EDF's board. Jean-Luc Magnaval, secretary of the Central Works Committee that EDF consulted with, told Newsnight that staff feared the cost of the project would cripple EDF. He said: "We have reservations about several aspects of the project: organisation, supply chain, installation, and procurement. "The trade unions are unlikely to give their blessing to the project in its current state. "We are not reassured by the documents we have received. We have been given a marketing folder, not the full information we require. "We got the documents on 9 May - we are sending EDF a request for more explanations." On Monday French Economy Minister Emmanuel Macron wrote to MPs on Westminster's energy select committee to reassure them the French government remained committed to the project. But Mr Macron added: "It is also necessary, in the interests of all, that EDF follows due process before committing itself to an investment of this magnitude. "The consultation of the Central Works Committee brings legal robustness on the decision." EDF chief executive Vincent de Rivaz also told MPs on the committee that he did not know when a final decision on the project would be made. Earlier this month, French President Francois Hollande said he would like the project to go ahead. Hinkley Point C, which would provide 7% of the UK's total electricity requirements, had originally been meant to open in 2017. But it has been hit in recent months by concerns about EDF's financial capacity to handle the project. While one third of the £18bn capital costs of the project are being met by Chinese investors, Hinkley Point would remain an enormous undertaking for the stressed French company. In March, Thomas Piquemal, EDF's chief financial officer, quit after his proposal to delay the project by three years was rejected by colleagues. In April, French Energy Minister Ségolène Royale also suggested the project should be delayed. Much of this scepticism is the consequence of problems in constructing nuclear power stations to similar designs elsewhere. 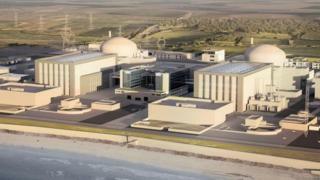 A plant being built by EDF at Flamanville in Normandy, northern France, has been hit by years of delays and spiralling costs. Furthermore, since the company is nationally owned, the decision is also subject to political pressure. A former energy adviser to the French government told Newsnight that while EDF did not technically need the backing of the trade union representatives, it would be very difficult, politically, to go ahead without it. Yves Marignac said: "Going for it would for the government be crossing a red line in their relationship with the trade unions, which would make it really difficult for the government, particularly with the perspective of the next general election when they will need to get some support of the trade unions. "Making a decision for the project is not possible right now. The political costs and the costs for EDF's financial situation are too high right now."